Sanctuary Records' UK recorded music business is to be closed as it focuses on its more profitable management arm. The decision was made by the firm's new owner Universal, which bought Sanctuary last month for £44.5m. 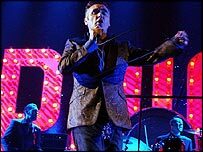 The closing business is home to artists including The Charlatans, Morrissey, Kelly Osbourne and Marc Almond. Sanctuary's US recorded music business, which counts Dolly Parton and Brian Wilson among its stars, is not affected by the decision. "In consultation with senior management of the Sanctuary Group, it has been decided that its Sanctuary Records UK division will no longer continue as a stand alone, front-line record label," Universal said. Sanctuary will continue to manage stars including Lulu and Sir Elton John. Music companies are struggling against the problems of falling sales of physical music such as CDs. Last month EMI reported a 13.4% drop in second quarter UK profits. And in the previous financial year, Sanctuary's UK record label was the main drag on profits, with half-yearly revenues falling 35%. As well as music management and its record company, Sanctuary also handles touring for artists including Amy Winehouse and James Morrison.